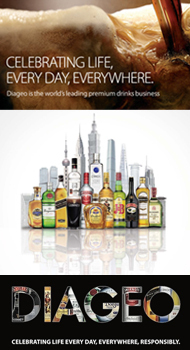 Diageo (www.diageo.com) is the world’s leading premium drinks business with an outstanding collection of beverage alcohol brands across spirits, beer and wine. We work to the highest standards of responsible marketing and continually assess the impact of our products on our environment and society. These brands include Johnnie Walker, Haig, J&B, Buchanan’s and Bushmills whiskies, Smirnoff, Ciroc and Ketel One vodkas, Baileys, Captain Morgan, Tanqueray and Guinness. Many of our brands have been around for generations, while some have been developed more recently to meet new consumer tastes and experiences. Our great range of brands and geographic spread means that people can celebrate with our products at every occasion no matter where they are in the world. This is why ‘celebrating life every day, everywhere’ is at the core of what we do. Trading in approximately 180 countries, we employ over 28,000 talented people around the world. With offices in 80 countries, we also have manufacturing facilities across the globe including Great Britain, Ireland, United States, Canada, Spain, Italy, Africa, Latin America, Australia, India and the Caribbean. And the people who work for us across these markets really care for the legacy of each of our brands. We want them to be enjoyed by consumers for generations to come, which means we also take our role as a producer of alcohol very seriously. Diageo is at the forefront of industry efforts to promote responsible drinking.